On soulless feet we cross the floor. An empty knocking at the door. And will, four years until we rest." What do the dead do? Why, dance, of course. (Vampires and skeletons especially, it seems.) It's the hidden language of the soul (whether they have a soul or not). And if the dead aren't immediately chowing down on you, they may end up leading you in a jaunty tune. This probably stems from the Danse Macabre , a medieval allegory about how death unites everyone, how no matter your station, everyone does the "dance of death." And who doesn't want to dance? So if you're a bloodsucker, a bag of bones, a bawling banshee or the bleak bringer of biolysis you can still boogie. People who are hanged by the neck are sometimes mentioned to dance "the hemp fandango", "the sisal twostep" or "the gallows jig", a quite-literally-Gallows Humor reference to the way people would thrash at the end of the rope (usually as a result of the condemned strangling to death rather than having their neck snapped by the fall). May or may not be related to the band Dead Can Dance, and has nothing to do with Deader Than Disco. See also Monster Mash, Skeletal Musician, Mummies at the Dinner Table and I Love the Dead. If the dead in question are zombies, then there's a good chance of them performing a Michael Jackson's "Thriller" Parody. One Piece: Brook, natch. Much of the Thriller Bark arc, actually. In particular the zombie hordes of Thriller Bark and their "Zombie Night" disco number. The theme song for Hakaba Kitarō talks about ghosts dancing. Princess Tutu has this trope show up twice, although considering the show is about dancing and can be darkly bizarre at times that might not be too surprising. The first time is in an episode based on the ballet Giselle, where a ghost of a woman that committed suicide dances against Rue and later Princess Tutu for the right to take Mytho to the Underworld. Later on, in the Depths of Despair, skeletons dance ballet — not to Danse Macabre, as you might expect, but Dance of the Dying Swan. You also might count Drosselmeyer, who occasionally does brief dance steps and is quite dead. Zombie protagonist Ayumu in Is This a Zombie? has been shown on a couple occasions to be a surprisingly good breakdancer. Averted in Yo Kai Watch, where schoolchildren are discussing yokai that they've seen around the school. One girl mentions "A skeleton who's bad at dancing". Zombie Land Saga has the titular zombies, who actually play with this trope a bit. Prior to their awakening to full sapience, the closest they come to dancing is full-body headbanging in the presence of death metal. Later episodes show them training to dance; in their second performance, the hundred-year-old zombie uses a much older form of dance and the still-mindless zombie only waves her hands in the air. Basically, the dead can dance... about as well as any living person. Judge Dredd: During the "Judgment Day" arc, the Necromancer villain Sabbat creates a bunch of zombie Elite Mooks who proceed to attack Judge Dredd's strike team while dancing and singing about how they love murder. Zombo: There are multiple sequences of singing and dancing zombies. Zombo himself has got some moves too. Tim Burton's Corpse Bride has the awesome song "Remains of the Day," where the dead sing and dance. It's even the trope picture. 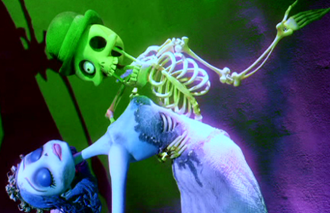 Similarly, The Nightmare Before Christmas has The Undead (along with all the other monsters) dancing, especially the protagonist Jack Skellington. The Rules of the Game has an actual danse macabre. Appears, naturally, in The Seventh Seal. Love And Death, Boris dances with the Grim Reaper at the conclusion. Beetlejuice (as you might expect) ends with a dance number featuring a living prima donna supported by a team of ghostly footballers. At the end of the John Travolta movie Michael, the archangel softshoes off into the end credits with a ghost as his partner. Woody Allen's film Everyone Says I Love You features a scene set in a funeral parlor where a recently-deceased grandfather's spirit steps out of his body and leads a troupe of fellow ghosts in dancing to the song "Enjoy Yourself (It's Later than You Think)." In Weekend at Bernie's II, despite being dead, Bernie dances when he hears music as the result of a voodoo spell. At one point in Dead and Breakfast, the zombies surrounding the protagonists stop their assault to break into song and dance, line dancing while a zombified Zachariah And The Lobos Riders play "We're Comin' To Kill Ya". The Incredibly Strange Creatures Who Stopped Living And Became Mixed Up Zombies is a musical with zombie dance numbers. Except they're not really zombies, and... oh, just read the movie's page. Dancing often features in the Fire and Brimstone Hell seen in some of Georges Méliès's films, usually because his Satan and minions are clearly having A Hell of a Time. Heck (no pun intended)—the short film The Infernal Cake Walk, with assorted demons cheerfully tripping the light satanic with the titular dance, is completely devoted to this trope. Did we mention it's from 1903? In Fido, a living woman and her family's pet zombie share a dance set to the Squirrel Nut Zippers' "Put a Lid On It". In Carnival of Souls, the protagonist discovers that the footloose dead take the loss of their dance partners SERIOUSLY. Shudder. In A Christmas Carol: The Musical, Marley's ghost and his fellow wandering spirits do this towards the end of the "Link By Link" musical number. The Dance of Death , as mentioned above, originated from the Black Death. When so many people died all around, many just decided to party for the last time. Tales of music animating the recently dead and causing them to dance can be found from Europe to the Far East. Almost all versions feature a husband going into haunted ground (ghosts or elves) in order to retrieve the dancing body of his late wife. Taoist exorcisms can involve a dance called the Step Of Yu to remove nearby ghosts. Baron Samedi, probably the most recognizable spirit in Voodoo tradition (at least to Westerners), is often portrayed as a skeletal man in his Sunday Best who loves dancing, feasting, and general carousing. Nightfall (Series): Vampires constantly throw elaborate balls. In Neil Gaiman's The Graveyard Book, on one night a year, the dead "dance the Macabray" (danse macabre) with the living. Even The Grim Reaper, the Lady on the Grey, dances with the main character. The only one who doesn't dance is Silas because he is neither living nor dead. In one of the books in the The Hollows series, Piscary's Pizzaria is turned into a vampire dance club. At the end of Reaper Man, he shows a sentimental side to someone who is dead. Miss Flitworth: I take it you do dance, Mr. Bill Door? Mr. Bill Door: Famed for it, Miss Flitworth. He is also strongly hinted to make a habit of joining in the Mardi Gras-expy festivities in the New Orleans-expy city of Genua, at least after the events of Witches Abroad have provided him with a top hat. In Johnny and the Dead, bag lady and time-traveller Mrs. Tachyon leads the ghosts in a re-enactment of Michael Jackson's "Thriller" video. Richard Matheson's short story "Dance of the Dead" has a group of young people in a post-World War III future visiting a nightclub where corpses are made to "dance" through the use of a nerve-gas spray. The "dance of death" was a popular medieval genre for literature/prints and depicted dancing Death leading a train of people from all classes and walks of life: the implication being that at death everyone is equal. In The Dresden Files, specifically Dead Beat, it is stated that zombies need music to stay animated. Specifically, they need a drumbeat to trick them into thinking that their heart is still beating. One of the book's Necromancers accomplishes this with a tricked-out vintage Cadillac featuring a monstrous subwoofer. For very big zombies, polka music works. Kalman Mikszath's novelette, The Deaf Blacksmith Prakovsky has a brief mention of three musicians who accidentally walked in on a ball of dead people. The first sign of something being amiss is the people thanking the DOCTOR for helping them make it to this wonderful party. In Skulduggery Pleasant: Death Bringer, the eponymous Skeleton Detective himself shows off his dancing skills at the Requiem Ball. The Haunting Hour features "The Halloween Dance", a story concerning a gathering of the undead who have a party in the world of the living, and then conclude the night with a dance that manages to slow down time. The Dead All Along protagonist attempts to reverse the dance to prevent his death, but it doesn't work out the way he hoped. The Greg Weisman novel, Rain of the Ghosts, ends with Rain dancing at a party with her grandfather's ghost. J. R. R. Tolkien's eldritch "Shadow-Bride" dwells below, with her eerie husband, "where neither days or nights there are; / But once a year, when caverns yawn / And hidden things awake, / They dance together then till dawn / And a single shadow make." When Good Ghouls Go Bad was a made for TV Halloween movie by R.L. Stine, the dead rise from the grave on the night of Halloween and everybody thinks it's a Zombie Apocalypse. But no, it's just the reanimated corpse of a goth kid from the 1980s who wants to finally display his statue celebrating Halloween and then have an undead dance festival. Really. The X-Files episode "Hollywood AD" invokes this trope. It is a fairly odd episode, even for The X-Files, but in it, Mulder proposes that the undead are motivated to fulfill the same drives as the living, and that they might eventually get to dancing, and laughing, and love. After he and Scully walk away, and just before the credits, you see a (fake) cemetery full of the dead dancing to some lively tune. In Lexx, "the dead do not enjoy dancing"... until they're transformed into actual epileptic trees. Then they cheerfully sway back and forth, praising Oberon the Fairy King to the tune of "Row, Row, Row Your Boat." It's Lexx. Every episode of Strangers with Candy would end with everyone in the episode dancing happily, and the series finale, after Jerri and the teachers rioted and destroyed the school, was no different. Except everyone was looking a little translucent this time. The Masters of Horror episode, "Dance of the Dead", written by Richard Matheson and based on his short story above. Vampires dance in Buffy the Vampire Slayer's musical episode. Angel also dances, horribly, in a mental scene. Wesley also dances in the same episode, equally horribly. But he's human. Played for horror in Carnivàle when a female carnie is murdered so the ghosts of the miners haunting a town can have someone to dance with. The Grim Reaper in Horrible Histories always dances to the "Stupid Deaths" opening jingle, and even gets a team of Thrilleresque zombie backup dancers in the Scary Special song. Pixelface: In "Bored to Undeath", the characters end up luring the zombies out of the console by running them through Kiki's dance training routine, then have Aethelwynne lead them Pied Piper-style with a portable stereo as they dance to Michael Jackson's "Thriller". Voltaire's "Day of the Dead". It's a lively tune about someone visiting Mexico during el Día de los Muertos (November 1, or the Day of the Dead/All Souls' Day), with expected results. Saint-Saëns's instrumental "Danse Macabre", based on a French poem by Henri Cazalis about Death using his violin to raise the dead and make them dance. The Skeleton Dance is based on this. Iron Maiden's "Dance of Death" has a narrator speak of their experience joining in a festival straight out of the medieval Danse Macabre archetype. Given the band's penchant for literary, historical, and musical references, it's a good bet they were well aware of Saint-Saëns's piece. Avenged Sevenfold's "Dancing Dead" describes a similar scene. Interestingly, on the same album, they cover an Iron Maiden song ("Flash of the Blade"), and A7X is also very fond of academic, literary, and biblical references. The Kingston Trio's "Zombie Jamboree". Bobby "Boris" Pickett and the Crypt Kickers's biggest hit, "The Monster Mash", which is Frankenstein's Monster inventing a dance craze. As mentioned in the caption above Oingo Boingo had a "Dead Man's Party." Elfman's involvement in composing for the Burton works mentioned in "Film" adds additional cool. The Insane Clown Posse's "The Headless Boogie" (a Spiritual Successor of sorts to "Monster Mash"). Halloween Treat, which was a Halloween-themed Disney clip show put together in 1982 for the then-debuting Disney cable channel, had a Dixieland jazz theme song with a "Gothic" sort of shuffle that in addition to being about equal parts goofy and ghoulish ("Tricks and treats to try tonight/....Your spirit's gonna howl tonight") is pretty danceable and is almost a guaranteed Ear Worm. Sound Horizon will have you know that Thanatos, dour god of death or no, is not against a good dance party. In addition, since the album following that one, Marchen, was effectively a Concept Album all about revenge from beyond the grave, this trope was perhaps inevitable in the live performance of it. It's particularly pronounced in "A Fairytale of Light and Darkness" and "The Song of Dusk." Toni Childs has The Dead are Dancing, with a repetitive chorus about how the dead are dancing in the town. Tom Petty's Zombie Zoo is superficially about a goth girl dancing at the Zombie Zoo. The old hymn "Dem Bones". The Vocaloid song Shikabane no Odori, which translates to dance of the corpses. "Move Your Dead Bones," a song from the movie Beyond Re-Animator. Both the original video and Zarla's popular flash cartoon feature this. "Thriller" is probably the most famous example in music. "Ghost" pulls it off as well, though sadly less impressive. Billy Idol is the all-dancing King of the Apocalypse . "Bones" by The Killers is probably close enough. Gorillaz's "Clint Eastwood" features dancing zombie apes. Lindsey Stirling is attacked by zombies and makes them dance to her violin in the video for "Moon Trance". "Cities in Dust " by Siouxsie and the Banshees, during the bridge. In "Dance In The Graveyards " by Delta Rae, some Dark Is Not Evil necromancers (or possibly death spirits) call up spirits of the dead for one last dance with their loved ones. Sharing a name with this trope: the band Dead Can Dance. There's a Calvin and Hobbes strip that invokes this by way of Woolseyism. In the original , Calvin and Hobbes play cowboys, and when Hobbes "shoots" Calvin, he gives him a "Death Rattle." In French, the translator changed it to, "It's the Danse Maraca-bre!" Feel free to groan, or gémir. Lucha Libre great La Parka, as seen here. In Warhammer there's a necromantic spell called "Vanhel's Dance Macabre", which makes the undead units it's used on move faster, presumably by making them dance. Magic: The Gathering has a card named Dance of the Dead , which raises a creature from the grave. Also, the much more unsettling card, Macabre Waltz . "All dead move to the hollow rhythm of necromancy." Death's Duet is yet another. "Life has always been a dance. It is only fitting that death sing the tune." Despite the flavor text, the card art depicts two nearly skeletal zombies dancing. The Munchkin enemy "Mr. Bones" is depicted as a dancing skeleton with a cane and a hat. From the Papers & Pencils blog: The "Dancing Skeleton Room" , an encounter scenario involving benign skeletons who are interested in nothing but dancing ceaselessly. In Carl Orff's opera Der Mond, the dead not only dance, but play ninepins and sing drinking songs. Evil Dead: The Musical, especially the number "Do the Necronomicon." The song "When the Night Wind Howls" from Ruddigore. Then is the ghost's high noon! A dance performed by cheerful skeletons opens the second act of KOOZA. Dancing ghouls appear in the "Thriller" sequences of both Michael Jackson The IMMORTAL World Tour and Michael Jackson ONE. Tanz Der Vampire's title actually refers to a social event, but the vampires dance several times throughout the whole show. The best examples of this are Carpe Noctem and Act II finale . In the final scene of The Consul, Magda (soon to be dead) has a vision in which her mother (already dead) dances with John (not dead yet but obviously doomed). The Magician: Choose a partner. The dance is on. Down here, among the dead! Elisabeth: The dead do dance in "Alle tanzen mit dem Tod" ("Everyone Has Danced With Death"), and it's implied that the company - including Lucheni, the narrator - are either ghosts or the reanimated dead, used to tell the story; in several scenes where there is a pause, background characters typically slump down on the spot, looking like discarded corpses. Shrek: The Musical: During the song "Donkey Pot Pie", the remains of Dragon's previous victims get up to dance with Donkey. The haunted house S.S. Frightanic: Fear in First Class from Universal Studios' Halloween Horror Nights took place in a Ghost Ship with the ghostly passengers waltzing in the ballroom. The ballroom scene in The Haunted Mansion has ghosts dancing to cheery party music from an antique organ. The graveyard scene also has a couple ghosts and skeletons dancing to the graveyard jamboree. Luigi's Mansion: Floating Whirlindas. They're just dancing and minding their own business... VACUUM TIME! In King's Quest VI you can enter the Underworld and play a bone xylophone to make all of the demons dance, including some skeletons doing a Rockette/line dance thing! See it in all its glory here ! In Monkey Island 2: LeChuck's Revenge, you get a hint for a future puzzle by watching your parents' skeletons dance while singing "Dem Bones" during a concussed hallucination. Mr. Bones was a Sega Saturn platformer/rhythm game about a skeleton army raised by an evil necromancer. The only one not under his sway is the titular Mr. Bones, the resurrected corpse of a blues musician who is free from the mind control because he has music in his soul. The object of the game is to get through the haunted woods and put on a music and dance show that puts music in the souls of the other skeletons to free them. The Wii Game Battle of the Bands has as a playable band: Scariatchi - a trio of Mexican skeletons who rose to play latin music and boogie. Gitaroo Man: The Sanbone Trio, a band of mariachi skeletons, is one of U-1's opponents. Thanks to starting their battle with a long and complex sequence where you can only defend, they're one of the hardest enemies in the game. Castlevania features Ghost Dancers enemies starting off with Super Castlevania IV where they also have a boss status in the form of Paula Ghoul and Fred Ascare. The Zombie class has their Thrill Dancing attack in Disgaea 4: A Promise Unforgotten which summons a mob of dancing zombies that convince the target to join in. Amusingly, it has a S rank for the damage it causes (Which is the highest). In The Legend of Zelda: Ocarina of Time, Bongo-Bongo, the boss of the Shadow Temple, beats his hands on the arena in a steady rhythm. What's the arena? A giant drum. In The Legend of Zelda: Majora's Mask, the Redeads in Ikana Castle will start dancing (either an endless pirouette or That Russian Squat Dance) if you put on the Captain's Hat, Gibdo Mask, or Garo Hood. There's also Kamaro, the ghost of a dancer who regrets that he never got to teach his dance to anyone before he died. A "good" death in The Sims 2 lets The Grim Reaper hand you an Umbrella Drink, while two "Hula Zombies" accompany you in traditional dance. Death is a tropical vacation, provided you've lived your life right. In The Sims 3's "Supernatural" expansion pack, zombies will climb their way onto your lawn during a full moon, and occasionally bring along a stereo for them to dance along to spooky music. Deep inside a castle in The Bard's Tale, you run into two groups of zombies having a dance-off. The moment they notice you, however, they drop everything to fight you. Zombie dancer: You got served! The Bard: What the hell?!?! Sam & Max Beyond Time and Space: Sam & Max once investigate "the Zombie Factory", which turns out to be a nightclub for zombies created by a vampire. Open Mic Night is every night! The gamestop pre-order promo for Batman: Arkham Asylum is a bonus level of dancing skeletons. They also sing "Dem Bones." The Dancing Zombies boss in Monster Party. The Dancing Zombie from Plants vs. Zombies summons a quartet of "backup dancer" mooks to guard him as they boogie toward your front lawn. Also in that game, if you grow the Tree of Wisdom high enough, it will unlock a cheat code of "dance" that makes several classes of zombie "dance" toward your position instead of walking. Burn, Zombie Burn! has a "Dance Gun" weapon that allows you to force the zombies to dance. While they're doing this, they won't attack you, giving you plenty of time to mow them down with a chainsaw, TNT, or other weapons. One of the playable characters in Bust a Groove 2 is Bi-O, a zombie who could do Thriller-esque moves. Spyro 2: Ripto's Rage! has a mission where you must collect all these bones to repair a caveman's skeleton friend. Once you collect them all he gives you an Orb and the skeleton forms together and dances (The music it dances to rather catchy too). A similar mission also appears in Spyro: Year of the Dragon. World of Warcraft, besides having dance animations for every playable race including the undead Forsaken, has an odd encounter in one of the Razorfen dungeons where the PCs walk in on a skeleton dance party. The skeletons are not amused. In Kingdom of Loathing, this is about half of what goes on in Spookyraven Manor's Haunted Ballroom. "In life his skin was sweet as mango / when I held him to my breast / but now we dance this Grim Fandango / and will for years before we rest..."
In Alone in the Dark (1992), a group of ghost ballroom dancers guards the pirate's key, and you must play the Danse Macabre (Dance of Death) record on the gramophone to make them dance and move away from it. Discworld II opens with a song and dance routine performed by skeletons. Judge Dredd: Dredd vs. Death: In the Mega Mall level, there's a hilarious bit in the nightclub where the zombies are ignoring the people trapped inside and happily dancing to the music as long as you don't disturb them. Played somewhat straight in Pokémon, because a number of Ghost-type monsters can learn the moves Swords Dance and/or Rain Dance. Uncroaked dancefighting. To "Thriller", naturally. Likewise the hundred dead ninja in The Adventures of Dr. McNinja, dancing to "Thriller", again. Led by Benjamin Franklin , of all people. Of course, it turns out to just be a dream, although the ninja zombies do in fact start attacking later on. In Homestuck, a dead Tavros breaks into a number of uniquely named dances in front of a flabbergasted Vriska. This is because he gathered an entire army by himself. In an early and maybe even first version of the trope, in the 1932 Betty Boop episode, 'Minnie the Moocher', Betty runs away from home and discovers singing and dancing ghosts and skeletons. Also "Betty Boop's Museum" has dancing skeletons from a museum exhibit. "The Skeleton Dance" features a band of rubber-hose skeletons dancing the night away in a graveyard. In "The Haunted House", Mickey Mouse has an encounter with a terrifying band of skeletons... who turn out to be quite friendly when he plays them some organ music. In "The Mad Doctor", dancing skeletons are one of the strange and alarming sights Mickey encounters when travelling through the Doctor's lair. A good chunk of the Van Beuren Studios Tom & Jerry short "Wot A Night" is centered on a skeleton composer playing a piano song, prompting his other skeleton friends to dance to it. The "Night on Bald Mountain" segment of Disney's Fantasia features dead spirits dancing and cavorting. In the early South Park episode "Pinkeye", the boys find themselves cornered by the marauding zombies of the townspeople... who then start dancing in a Thriller parody while Chef sings about how he will make sweet love even when he's dead. The zombies in Miracle City are highly offended when El Tigre tells them they can't dance. They then prove to him how wrong he is with a spectacular dance number in no way reminiscent of Thriller. The dead dance in the Scooby-Doo! Mystery Incorporated episode "Dance of the Undead". Although, they turn out not really to be undead after all. According to the ditty sung by Brom Bones in Disney's animated version of The Legend of Sleepy Hollow, the reason for the Headless Horseman being so vicious is because he's so scary even the other spooks don't want him around, and they won't let him come to their parties. Count Duckula, Season 1, Episode 1 sends the Count seeking a magical saxophone in an ancient Egyptian pyramid. When he plays, the previously inactive mummies get up to get down. In Over the Garden Wall, the residents of Pottsfield celebrate a seemingly endless harvest festival, including dancing around a maypole, and are soon revealed to be costumed skeletons. Enoch: What a wonderful harvest. And what about you? You sure you want to leave? Enoch: Oh, well. You'll join us someday. Beetlejuice loves to dance. He and his best friend Lydia dance in several episodes, including the pilot, and quite often while levitating. Don't forget Disney's The Haunted Mansion rides. Similarly, the Dutch amusement park "De Efteling" has a Haunted Mansion with the same theme where the dead dance to the "Dance Macabre". The musical piece by Saint-Saëns mentioned above is based on a poem by Henri Cazalis which was in turn based on an old French superstition that said that Death appears at midnight on Hallowe'en and calls forth the dead to dance while he plays the fiddle until the break of dawn.